To state things plainly is the function of journalism; Alex instead writes fugitive reviews, allusive, symbolic, full of imagery and allegory, and by leaving things out, he allows the reader the privilege of creating along with him. The eponymous Mr. Smith seemingly falls victim to more than amnesia; his mind betraying his actions, he fears that he has become a devious murderer without a corpus delecti. But in the Hammer Studios idiom things are never quite what they scream. “Chris Smith” awakes from a car crash without memory of his past, his only possession a torn magazine cover sporting the lovely visage of a beautiful woman. Does this woman hold the key to unlocking his past? As he recuperates, an unknown benefactor pays his medical bills and even sets him up in a penthouse apartment. Lurking in this empty building are disembodied voices and, strangely, two exotic birds in a gilded cage. Meanwhile, Chris hires a private investigator to discover the identities of his mysterious patron, the cover girl and himself! The tangled plot quickly becomes a web of writer’s conceit, becoming more convoluted than reason allows. 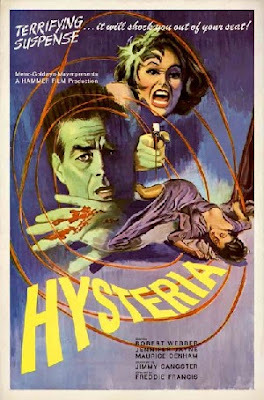 Freddie Francis helms this tepid thriller penned by Hammer journeyman Jimmy Sangster, imbuing the film with a visually arresting form which is often more interesting than the illogical plot. The opening montage foreshadows events to a snappy jazz beat, which seems better suited to a beatnik road film than a psychological thriller. The film quickly becomes talky and explanatory, revealing plot points through exposition instead of exhibition. The slow pace is burdened further by Robert Webber whose bland performance makes it difficult to empathize or care much about his predicament. But Francis captures Webber in intriguing mise-en-scene: a triptych in a mirror reflecting his fractured memory; or an extreme high-angle omniscient shot where Webber moves through the crisscross lines of an empty parking lot like a game piece; and framed through the metal bars of a birdcage. Thanks to Francis the film is technically sound but the fatal flaw is embedded in the plot itself, as the tail (or tale) wags the dog. A myriad of events must come together just right for this complex murder to be successful and ultimately, it’s not very believable. When the big reveal is exposed and Smith cops to psychological fraud, he becomes complicit in this humdrum battle of (nit)wits. You gave it a C- so I don't think I'll be seeking this one out but I do appreciate your honest review on an obscure film. Always a pleasure visiting here! I forgot to ask "Why is he green in the poster?" ha ha I'm not sure why it's troubling me but I find it very odd and if he had turned green after the events that would have at least been something interesting to look at. All Original Content of this Blog Copyright of Alex DeLarge, Ltd.
"To state things plainly is the function of journalism; Alex instead writes fugitive reviews, allusive, symbolic, full of imagery and allegory, and by leaving things out, he allows the reader the privilege of creating along with him." The Korova Theatre utilizes the very latest in high-definition technology: it is a Reference Quality 7.2 Cinema experience! Click photo for complete technical details. Korova Award Winners: Best Films of 2010! Korova Award Winners: Best Films of 2011! This is the end. Awesome Inc. theme. Theme images by i-bob. Powered by Blogger.